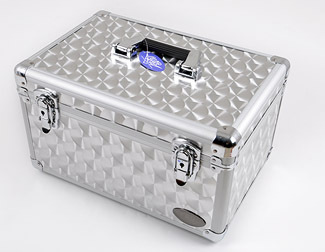 An upgraded case that is extra heavy-duty (and still light weight); has recessed, steel, butterfly latches; and a better handle! Note: Price includes the case only. Pedals are shown for a size reference only and are not included. I just got this yesterday and already it has been tried and tested. Today I was driving down the road when my little cousin thought it would be funny to throw this out the window of my truck. I quickly turned around and pulled over to find that the case was barely scratched and my pedals were perfectly fine. Overall, Amazing buy! Thank you so much for the fast shipping and quality item. The pedal board I purchased is absolutely wonderful. Definitely not a cheaply made eBay item. Guitar Center wants 200% more for a similar item. I appreciate you being an honest and great seller. It's sellers like you that make me love buying things off eBay. Expect to see more business from me and the rest of my band in the near future. Thanks again! The pedal board arrived today. No damage or rash in packaging. Item looks great. As a pro (paid) church musician, I'm very pleased with what it is. And quite happy with the cost. It's a well made, attractive pedal case for the average player. Thanks! Question: Is the lid removable? Answer: Yes! It's genius! 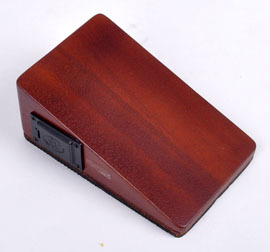 You simply place the pedal case down so that the thin lid is on the bottom, and the body of the case is on top. Remove the top part. The lid remains with the pedals, and you can use the lid as a pedal board. Question: Where do you place the pedals? Answer: On the lid! You can use the included handy-dandy double stick tape and Velcro to secure them. Question: Are the pedals shown in the picture included with the pedal case? Answer: Are you kidding? No! 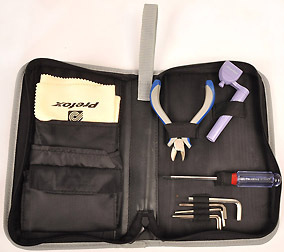 Omega TK-002 Tool Kit$10.95 On Sale!